It goes without saying that we're advocates for blogging, and we especially think one of wedding pros' greatest marketing tools is a business blog that showcases their work, their goals, and their marketing messages. Google continues to love local and fresh content, so why not take advantage of this fab and free resource? Well, we have our local SEO expert (and Tidewater and Tulle's very own Features Editor! 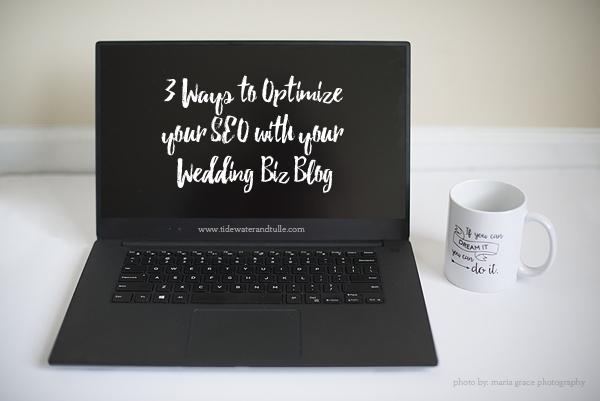 ), Maria of Maria Grace Photography to hopefully convince you and share some of her top tips for optimizing your business blog for the best kind of SEO! If you are a wedding professional, you have heard over and over again how important blogging is for search engine optimization (SEO) and getting found online. You know it's important, you know it's a great way to reach new clients, but you may not have any idea how all of these pieces are connected. The good news is that, with a strategic plan in place, you can quickly and easily optimize each and every blog post in a way that will attract your ideal client and increase your search engine ranking. I can't stress this tip enough! Most wedding pros simply write what they want when they want. This tip is a two-fold suggestion. First, create a blogging calendar for the next 3-4 weeks. Even if you do not have every single post written that far in advance, you can plan ahead to blog photo shoots, weddings, information for brides, grooms, or wedding professionals, and more. Seeing it all laid out on a calendar will give a consistent and cohesive rhythm to your blogging. After you have planned your calendar, take five minutes to plan your blog posts before you write them. Think about what elements you can include that brides may be searching for – from specific flower types to wedding venues and more. Jot these down so you can naturally incorporate search topics into your blog post. This will allow you to write in your own voice but in a strategic way. Use (but don't overuse) keywords. Tying right along with planning ahead, make sure to use keywords in your blog posts! I will preface with this, however: do not overuse keywords or, as Google terms it, employ 'keyword stuffing.' Your blog should be a natural outflow of you and your business, not a post full of search terms. Not only will your audience quickly become bored, search engines can tell if your post is not authentic and your rankings can actually drop. Instead of keyword stuffing, use your planning time to be strategic. For instance, if a wedding is held at the Woman's Club of Portsmouth, I will make a few mentions of this venue in my blog post in a natural way. Some examples might be, "This gorgeous wedding was held at the Woman's Club of Portsmouth, one of my favorite venues" or "The bride chose the Woman's Club of Portsmouth for her wedding day because of the scenic location and beautiful springtime appeal." Whatever you do, stay consistent with your voice while incorporating wedding-related keywords. And when in doubt, perform a quick search and read other blogs to see what keywords are being used! Find new ways to share your content. All of us know that we should share our blogs to social media – and if you aren't already doing this, start now! But beyond using your Facebook page, Instagram, and Twitter to share your posts, find new ways to spread your content out. This can include submitting content to wedding blogs of course, but it can also be as simple as reaching out to other vendors with a link to your blog. If you mention their role in the wedding or event, they are likely to share it and increase traffic to your website! You can also use social media to your advantage by sharing your blog links directly to the appropriate vendor pages. Thank the vendor for their involvement and post the blog to their page – even if they don't share the link personally (most do! ), other visitors on their page will see your post and be able to view your blog. And increased traffic equals increased SEO! These are just a few tips on how to utilize your blog to increase your SEO – a great starting point for any wedding professional! Be consistent, be strategic, and above all stay true to your voice and you will soon begin to be found online. Need more help with SEO? When Maria isn't making Tidewater and Tulle's real weddings look and sound amazing, she is a wedding and family photographer at Maria Grace Photography and provides SEO Training for Small Business Owners that covers the basics of what every entrepreneur should be doing right now to improve their search engine rankings. For more information on SEO training and coaching, click here.